kuyoo is a Buddhist service, usually a funeral rite, but not only for humans but also for other things, like animals and even dolls.
. Observance KIGO for autumn . Old dolls, which have incorporated the "souls" of their owners, can not simply be thrown away! So there are "funeral services" for them. 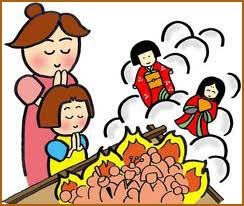 Many temples in Japan feature such a burning of old dolls. Some of them are very famous. Ningyo Kuyo is a memorial service for beloved but now unwanted old dolls, which are offered to the goddess of mercy (Kannon bodhisattva). Before the ceremonial burning nuns of Hokyoji temple comfort the souls of the dolls by chanting sutras. 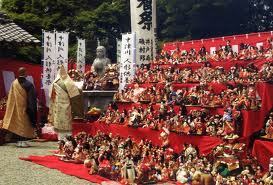 Kannon is especially worshiped by women who wish to become pregnant and they also bring dolls hoping for offspring. Hokyoji temple is an old nunnery, which served as a residence of imperial princesses. When a young princess went to the nunnery, the family sent her exquisite dolls to assuage homesickness. For instance Princess Kin received a doll with long orange-red hair reminiscent of a kabuki actor. This type of doll was believed to fend off hoso (chickenpox). Hokyoji maintains a number of antique dolls as well as sugoroku, kai awase, and other elegant, graceful, imperial play games. The temple is known as Ningyo-dera, Doll temple. Earlier people believed that evil spirits could possess old abandoned utensils and turn them into spectres. A strong attachment to a thing might cause a spirit called tsukumogami, attachment god. An item’s old age (100 years) could also arouse this spirit. Paper lanterns or broken sandals might bear tears which became eyes and sharp teeth, thus giving a horrifying visage. Worn prayer beads or teacups could merely manifest faces and appendages, giving a warm and friendly appearance. Though mostly tsukumogami were harmless they did have the capacity for anger. They could band together to take revenge on those who threw them away thoughtlessly. Modern items can’t possess tsukumogami, because these spirits don’t withstand electricity and few modern objects are used more than 100 years to gain a soul. They are a type of Japanese spirit. According to the Tsukumogami-emaki, tsukumogami originate from items or artifacts that have reached their 100th birthday and thus become alive and aware. Any object of this age, from swords to toys, can become a tsukumogami. Tsukumogami are considered spirits and supernatural beings, as opposed to enchanted items. 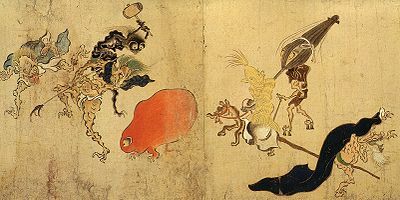 Though by and large tsukumogami are harmless and at most tend to play occasional pranks on unsuspecting victims, as shown in the Otogizōshi they do have the capacity for anger and will band together to take revenge on those who are wasteful or throw them away thoughtlessly. 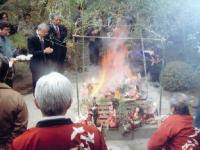 To prevent this, to this day some jinja ceremonies, such as the Hari Kuyō, are performed to console broken and unusable items.
. Tsukumogami 付喪神 "artifact spirit".
. Hakata Dolls 博多人形 . 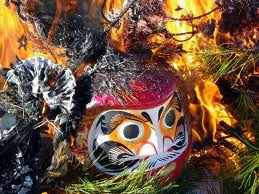 Most Daruma Dolls are thrown in ritual fires around New Year. People then buy new ones to protect them in the coming year.
. Sagichoo Festival 左義長（さぎちょう） . memorial mound for fish, by the sea, erected by the local fishermen to appease the souls.
. kubizuka 首塚 memorial mound for a beheaded person . This autumn hokku is from the 8th month of 1823, three months after Issa's wife Kiku has died and four months before his ailing baby son Konzaburo will die. In the hokku a lightning flash momentarily reveals a small requiem mound or perhaps some stones piled up. There may be a small stone stupa shape on its top as well. Literally a "requiem (kuyou) mound," in Issa's time this means a mound built to memorialize a dead person and/or to pray for the liberation of the person's still-attached soul. A requiem mound can serve as part of a grave or stand separately, as a public place in which many people can pray for the onward movement of the soul, often the soul of a famous person, toward the other world. 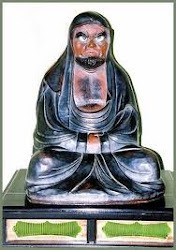 Prayers consist either of sutra readings or of chanting the name of Amida Buddha. In Issa's time, the location of a person's remains was generally less important than the activities of his or her soul after death, so requiem mounds were frequently located some distance from the physical remains and the grave, that is, they were built as close as possible to the area in which the dead person's soul was believed to be still having trouble leaving this world and going on to the next -- often the Pure Land. Requiem mounds for slain warriors were often located near the spot where the warrior had been killed, and the same was true for people who died as the result of a crime or accident or disaster such as a flood or earthquake. 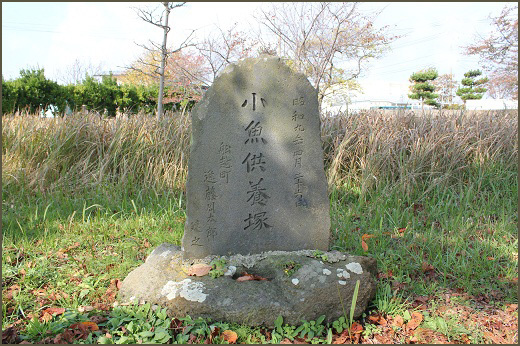 In Issa's hokku the exact nature of the mound is not described, although it seems to be located on the seashore where the fisherman once lived. Perhaps the mound has been built by villagers in order to aid and soothe the soul of the fisherman, who simply disappeared in a storm at sea. The local people may feel that, since the man died in a terrible accident, his soul is still suffering, and this resentment keeps his soul attached to his previous existence. After the lightning flash, does Issa, too, decide to chant the name of Amida in front of the mound? In his diary for this month Issa does not mention visiting any seaside areas, though he does write that he went to see kabuki, and the hokku after this hokku in Issa's diary is about villagers watching kabuki, so this hokku may possibly refer to a scene in a kabuki play. If so, Issa might be evoking the kabuki play "Fujito," which is based on a noh play with the same name. In the kabuki play a famous warrior murders a young fisherman (ura no otoko) in order to keep him from telling anyone else after the fisherman teaches the warrior secrets about using the local coastline's features to achieve a military victory. Later, when the warrior is governor of the province, the dead fisherman's mother appears and accuses the warrior of the murder. He finally confesses, and he recovers the fisherman's body from bottom of the bay, where he hid it. He also goes to a temple near the site of the murder and has the monks say requiem prayers for the dead fisherman's soul. Finally, after the warrior himself begins to lead a large requiem service, the fisherman's soul appears in the form of an angry dragon, a creature closely associated with lightning and rain. In fact photos of kabuki stage performances of "Fujito" show the fisherman-dragon wearing an upper cloak with lightning-shaped designs on it. In the play, the warrior is in the end able to soothe the fearsome dragon-like soul and help it move forward toward the next world. If Issa is also evoking the kabuki play "Fujito," then the flash of lightning itself suggests the arrival of the dead fisherman's soul in the form of a storm god.